If you know me, you know how much I love purple. Add holographic? I'm sold. So when KBShimmer came out with Quick And Flirty in their Spring 2014 collection, I had to buy it (with a few others). I used a base coat of Cult Nails Get It On, 2 coats of polish and topped it with KBShimmer's top coat Clearly On Top. This was also my first time using Clearly On Top and I was happy that it didn't dull the holographic properties of the polish. Full on sun. Hello beautiful. So you can see there is a nice glow on this polish - easy to apply, no flooding in the cuticles. Even in the shade you can see this lovely scattered/linear holographic all in one. And it's all mine. Muahaha. I need to check this against a few older polishes of mine (that are now discontinued) to see how close they are. 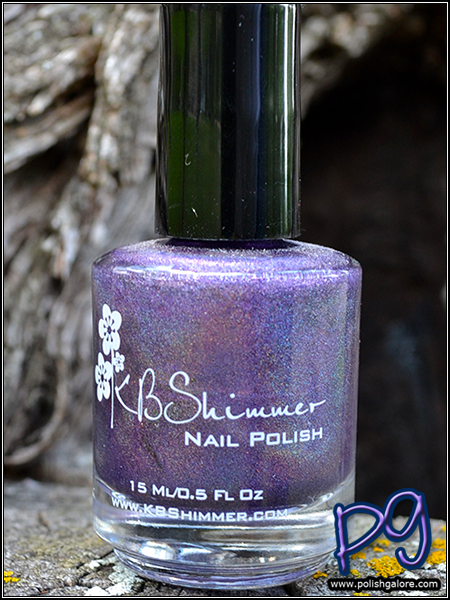 KBShimmer [website] can be purchased through their website for those in the United States and through Harlow and Co for international sales. Prices range from $7.50 to $8.75. Connect with KBShimmer through their social media networks: Facebook, Twitter, Instagram and Pinterest.